Save the hassle of deep-frying with this easy baked sweet potato fries recipe that's just as easy to make in your grill as it is in your oven. You can choose to make them plain with just a little kosher salt or spice them up a little with some pepper. You may even want to try something more exotic like curry or cinnamon, maybe some cajun instead? 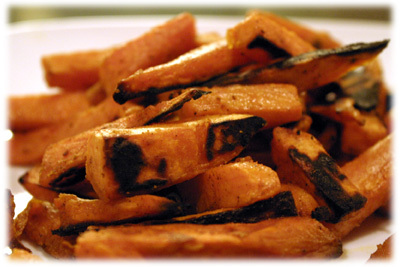 Cut the sweet potato into evenly sized french fry shapes, toss with oil and add your favorite spices. 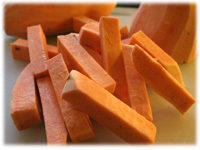 Baking times over indirect heat are give and take, it depends on how large or small you cut the sweet potato. Check them occasionally during cooking to ensure they're not burning and flip them once halfway through their cooking time. 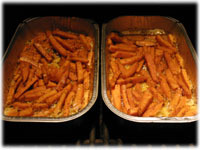 This sweet potato fries recipe makes a great side dish (try them with one of our gourmet hamburger recipes) or they can stand on their own as an appetizer or late night snack. 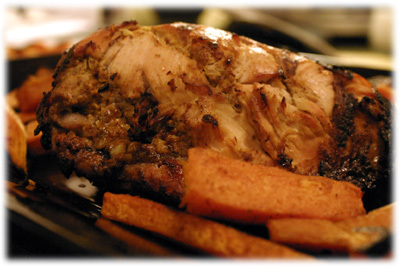 Tip: consider spices like curry, cinnamon, cajun seasoning or just black pepper. Tip: the sugar is optional, it helps with carmelizing the fries while cooking. 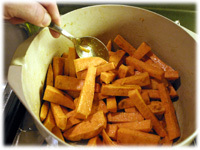 Peel and wash the sweet potatoes and dry them well (otherwise the oil won't stick properly). 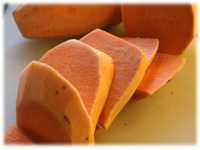 Slice each sweet potato in half. 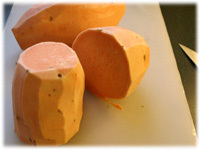 Stand one of the potato halves on it's flat side on your cutting board and cut it into approximately 1/2" slices. Now cut each slice into "sticks" or fries that measure about 1/2" wide. You should now have french fry shapes that are about 1/2" by 1/2" evenly and a few inches long. Even shapes makes the cooking more consistent. They won't all be exactly alike or perfect but try to get them fairly even. 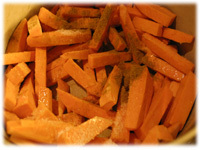 Place the sweet potato fries in a large mixing bowl or resealable freezer bag and add the oil, kosher salt and any optional spices and sugar you want. 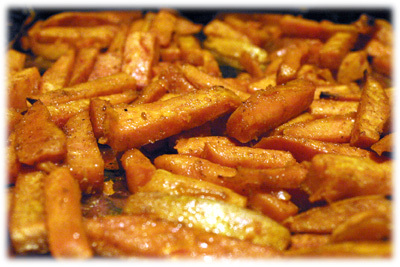 Stir the sweet potato fries so the oil and spices completely cover each piece. Preheat the grill to 450F - 500F and setup for indirect cooking (light only one side and you'll place the fries on the unlit side). 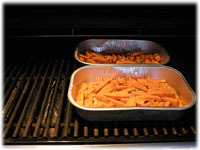 Place the oiled sweet potato fries in a greased disposable aluminum pan and when the grill reaches cooking temperature place the pan on the grates, not over direct heat and close the lid. Check several times, stir them around and halfway through cooking try to flip them all over with a spatula. After they've softened transfer the aluminum pan of sweet potato fries over the direct heat (over the flame) for 5 minutes or so. Keep an eye on them and stir them often. Since they're now over the direct heat they'll begin to cook very rapidly and can easily burn. Once they're nice and crispy and cooked to your satisfaction (go ahead, test one!) then remove them from the grill and serve. Some of the smaller ones may be cooked a bit more then others but they'll still taste great.